The perfect introduction to surfing, or a great place to improve your skills. This group lesson is a great way to spend a couple of hours in the ocean. The perfect introduction, this group lesson is a fantastic way to begin surfing, or just improve your skills. There will be a maximum of eight students in your group, allowing your coach to provide valuable feedback every step of the way. 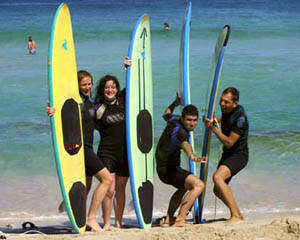 Most lessons are held at beautiful Rivermouth beach, where Margaret River hits the ocean. It's the best spot to teach beginners, on the inner beach break. More advanced surfers can be taken to any of the more advanced breaks along the coast - it all depends on what you are up for! Just let us know when you book. All lessons (beginners through to pro) progress through the skills of surfing according to the students' abilities and previous experience. The instructors will start by checking the surf conditions with you and lead into the warm up to prepare your body for a session of surfing fun, entertainment and improvement. Classes run from November to May. Classes run from November to May. Safety is obviously really important to us - otherwise we wouldn't be able to do this! All our coaches have completed coaching courses and been accredited by the Australian Surfing Association (ASA). And every year, each coach has to refresh their Bronze Medallion swimming qualification. It was a great experience for our "kids"...Hayley was friendly, hard working and completely devoted to teaching surfing to the kids....a brilliant experience thanks! The girls absolutely loved the surfing and I loved seeing the look on their faces once they surfed a wave. Priceless!